Magdalena Gauer: nurse and church worker; born on 14 September 1922 in Alt-Rosengart, West Prussia, the oldest daughter of Franz Lemke and Selma (Wiehler) Lemke. Magdalena married Gustav Gauer (13 October 1926, Sniatyn, Poland - 26 December 2012, Abbotsford, British Columbia, Canada) on 17 August 1951 in Hamburg, Germany; they had four children: Ralf, Benno, Gerald and Ingrid. Magdalena died of heart failure on 7 August 2010 in Abbotsford, British Columbia. Magdalena’s father Franz, a believing Lutheran, joined the Mennonite Church when he married Selma. Magdalena grew up on a farm in West Prussia. Her maternal grandfather, Johann Wiehler, was a well-to-do farmer and an active member of the Thiensdorf and Preussisch Rosengart Mennonite Church. He was aware of the social and spiritual needs of his neighborhood and established an orphanage and a senior citizens home in his village. Together with Adolf Lemke, Magdalena’s paternal grandfather, they founded a mission outpost of the Landeskirchliche Gemeinschaft, a nondenominational Pietistic fellowship, in which both were lay preachers and Franz, Magdalena’s father, was the youth leader and music director. Magdalena lived through the last years of the Great Depression during the early 1930s, the Hitler era, and World War II. She was baptized upon her faith in the Mennonite Church in Thiensdorf during the Pentecost celebration in 1943. After graduation from business school she was drafted to be a secretary at the military airport in Königsdorf. She volunteered to help the German Red Cross unit at the railway station to care for returning soldiers and refugees. She preferred that work to the semi-military service at the airport and became a full time nurse at the military hospital in Marienburg. By January 1945 the Russian army had advanced to the gates of Marienburg. Fearing for their safety, most of the medical staff at her hospital fled one night. But Magdalena’s conscience did not allow her to abandon wounded solders. By the grace of God, a medical officer was able to arrange transport a few days later for the remaining staff and patients through Red Army lines. The hospital was then re-established in Schwerin, western Germany. When the war was over, the hospital was transferred to Hamburg, where Magdalena completed her professional training as a registered nurse. Magdalena learned to know Gustav Gauer in the Hamburg Mennonite Church. They married in 1951 and soon joined Gustav’s family in Winnipeg, Canada. Due to more favorable working conditions, the Gauers moved to Vancouver, British Columbia. 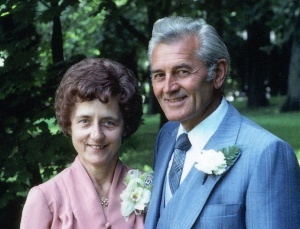 Magdalena and Gustav joined the Vancouver Mennonite Brethren (MB) Church where she became an active member, and consented to be baptized again in 1953. Following the tradition of her forebears, she invited non-Christian neighbors and friends to her house and shared her faith with them, holding Bible studies and prayer meetings. Responding to a call from Mennonite Brethren Missions and Services International (MBMSI), Gustav and Magdalena served in mission outposts in Salzburg and Linz, Austria from 1982 to 1984. After their return, they accepted a full-time position for five years as lay leaders in the Willingdon MB Church, in Burnaby British Columbia, in pastoral care and visitation. In 1996-97 they were interim pastors in the Mennonite Brethren congregation in Bad Reichenhall, Bavaria, Germany. They retired in 1990 to Abbotsford and joined Central Heights MB Church and later Bakerview MB Church. Magdalena was active in these churches, hosting friends and strangers, encouraging them and sharing her faith with them. In the last years of her life she lost her eyesight but kept her spirit active. Lemke, Helmut and Ralf Gauer. "Gauer, Magdalena (1922-2010)." Global Anabaptist Mennonite Encyclopedia Online. June 2013. Web. 21 Apr 2019. http://gameo.org/index.php?title=Gauer,_Magdalena_(1922-2010)&oldid=132519. Lemke, Helmut and Ralf Gauer. (June 2013). Gauer, Magdalena (1922-2010). Global Anabaptist Mennonite Encyclopedia Online. Retrieved 21 April 2019, from http://gameo.org/index.php?title=Gauer,_Magdalena_(1922-2010)&oldid=132519. This page was last modified on 3 August 2015, at 17:25.